1. These lines show the unpublicised transportation of dead bodies, some clearly being repatriated to their home states from America’s retirement mecca state of Florida. 2. 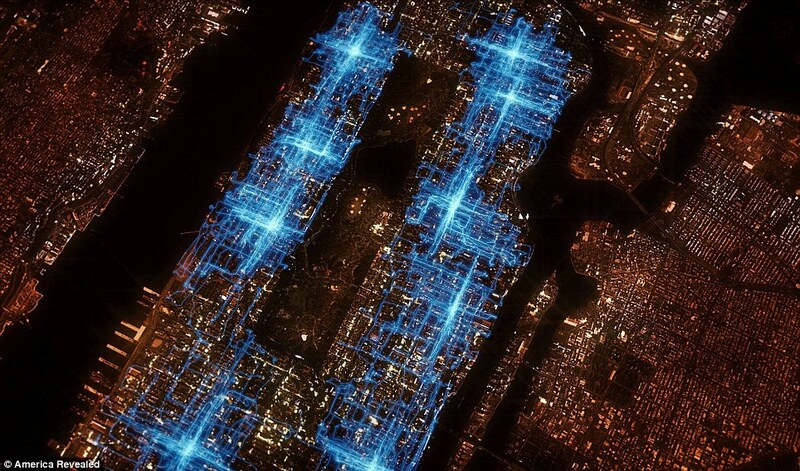 GPS trails reveal the routes taken by cycling pizza delivery riders on one Friday night in Manhattan. Each rider’s shift lasts eight to nine hours, in which time they can deliver between 30 and 40 pizzas all over the city. 3. America exports beef on a vast scale to the rest of the world, but at the same time imports $86 billion worth of food. This image shows the coming in and going out of food of the nation. 4. 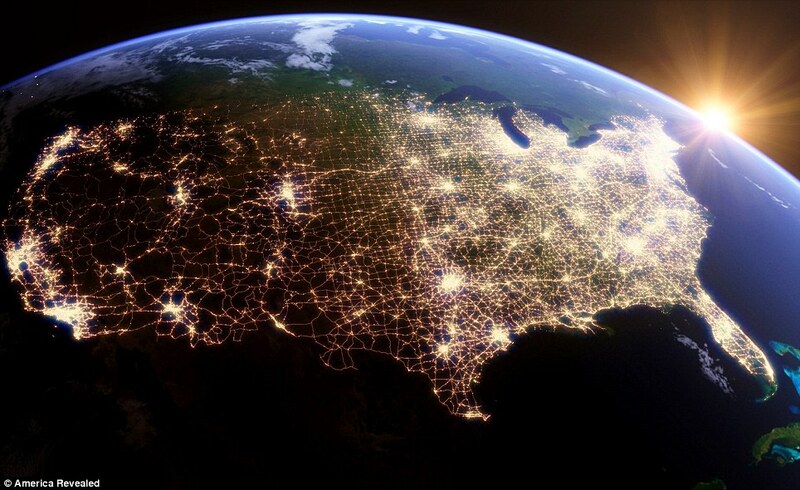 With a population of over 312 million people and covering 3.79 million square miles, America is the world’s third largest country. 5. 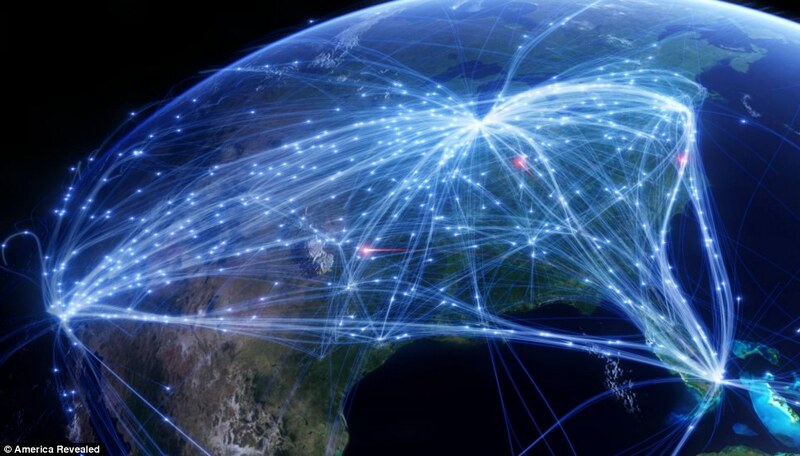 Flight data for the 50,000 planes that carry 2 million passengers daily across the USA, shows how airways connect every corner of the country. 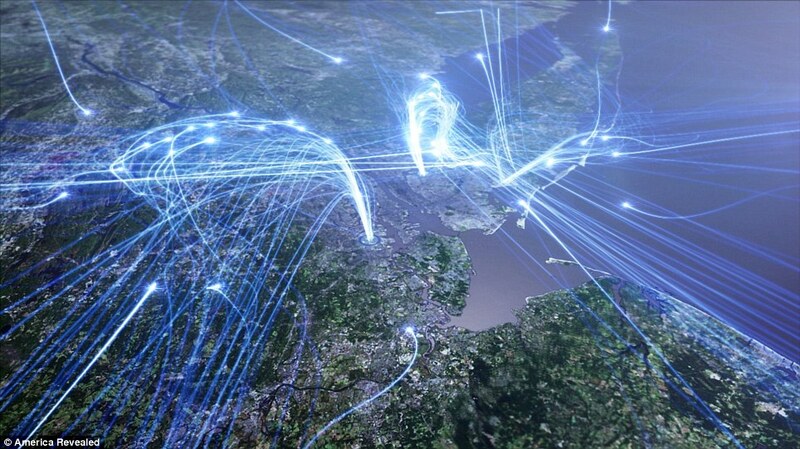 In this image the major airport hubs are clearly visible. 6. 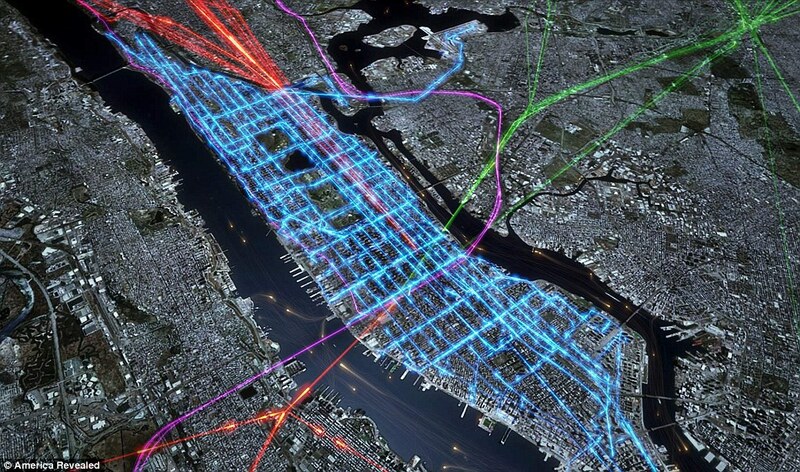 New York’s multi-layered morning rush hour detailed by the combined pathways ferries (orange dots), commuter rail services, (green purple and red) and the bus services (blue) that criss-cross the city picking out its famous grid pattern. 7. Truck movements supplying Domino’s Pizza network, which shows how pizza customers in Manhattan are fed ingredients supplied via a supply hub in Connecticut. That hub is in turn supplied Pizza dough, peppers, mushrooms and tomatoes by fleets of satellite tracked, refrigerated trucks. 8. 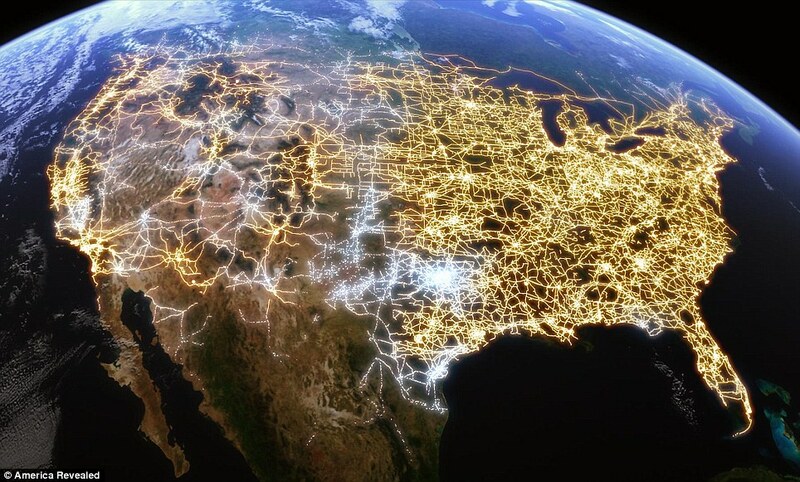 The American electricity grid: with its cities connected through a vast network. 9. Unemployment: The number of job losses in the USA. chronicled in this image. 10. 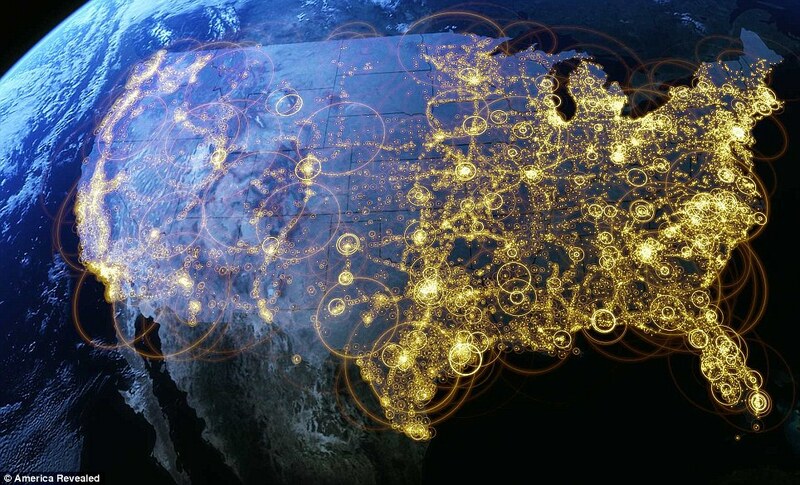 The array of communication towers across America that enable almost anyone to communicate or connect to the internet, wirelessly. 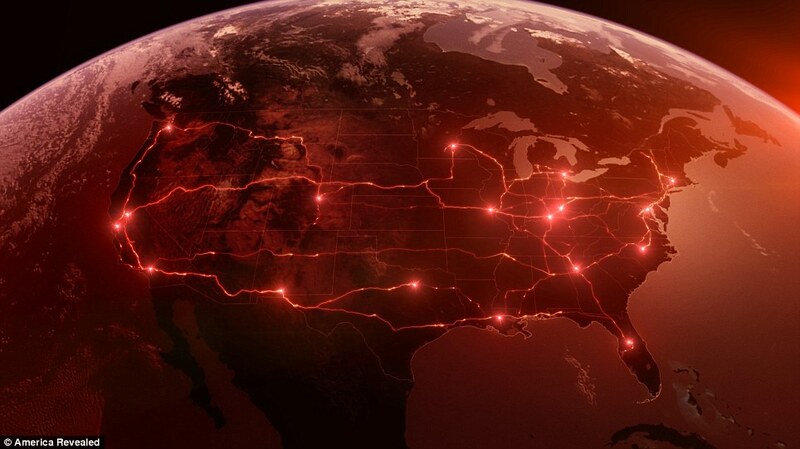 wondering who keeps tracking these movements….can imagine a corporation or two….plain scary. impressive technologies to make this possible. I hate satellites for this very reason – the ability to know in which chair I am sitting and who I am talking to. Such beautification of surveillance, it almost feels good. Big Brother society is surely here, get ready for acute surveillance anxiety. Is this part of TV show, something called “America revealed”..I think I saw a promo somehere. Would love to have some large posters of these! 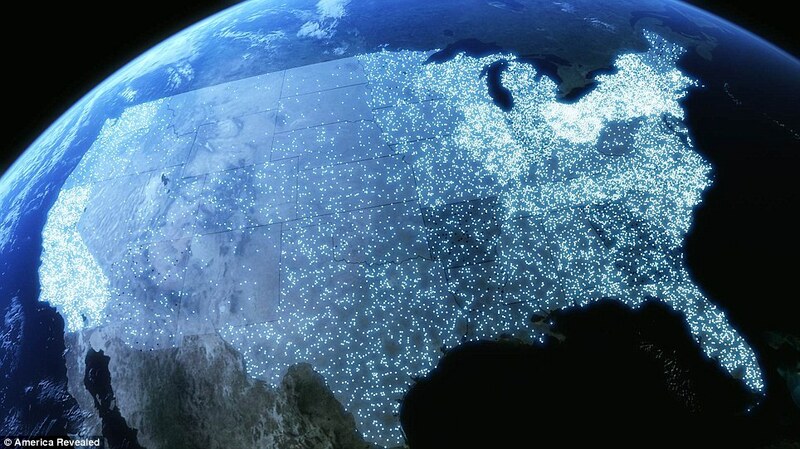 I need to know what kind of professional software is needed to take high resolution and updated images from satellite. Google maps, microsoft visual earth and other free online websites doesn’t give updated and high Resolution satellite images. 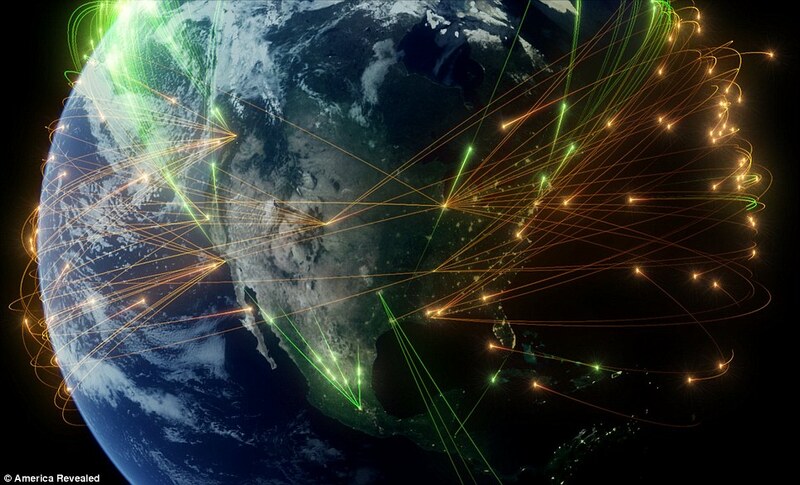 I’m sure there should be some professional licensed softwares to use and capture Satellite images. Like the softwares that are being used by the US Department of Defense or even America revealed and other governmental agencies. So anything and everything can be tracked huh, surveillance society has arrived well and truly. America is not the name of the country. The term America represents every country in North and South America. the United States of America or the United States or the USA or the US are acceptable, but just calling it America is arrogant and misleading. Would it be possible to get higher quality versions of these? Would love to use some of them as desktop wallpapers. Quite a lot of effort has gone into the making of these maps I think. Kudos to the team. The unemployemnt map is quite intruiging. Whoa this is wow and how.. will be interesting to look at a global visualization…u know the haves and have nots… the unilluminated world. OMG this is truly incredible! Big bro is always watching haha. Eye in the Sky.